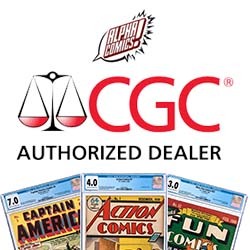 Alpha Comics stocks today’s greatest comic titles for fans of all kinds in Calgary, Alberta. In this wildly immersive and inventive medium we work to have all you could want. We have the big publishers like DC, Marvel and Image. Additionally we support interesting new stories and independent voices as well. Whether you are new to the world of comics or well versed in the four-colour world you will feel welcome here. We will surely have what you are looking for or will guide you in the direction of a new favorite. Since opening in 2011, Alpha Comics has been a proud supporter and advocate for local talent and creativity. We host artist events, stock local works and foster an environment that gathers together the city’s most passionate and creative sources. Whether during the bustle of New Comics Wednesday, Free Comic Book Day or Calgary Artist Challenges. Alpha is an environment that is ecstatic to welcome new faces into comics and perpetuates inclusivity and camaraderie amongst fans. Since our inception we have hosted dozens of signings. Up and comers like Fiona Staples (Saga), Riley Rossmo (Drumhellar), and Kurtis Weibe (Rat Queens) have visited our store. Alpha has been a hub for creators and fans alike, continually representing the comic community in the best way possible. Our walls are adorned with original artwork, shelves upon shelves of single issue comics, trades, hardcovers and other collectibles. As well – we have a simple and FREE weekly subscription service, events and gatherings to introduce you to new friends and comic titles. You can easily contacted and engaged online whether on Twitter or other social media outlets with our staff. Our shop is dedicated to delivering the most fun experience possible, in store, or in the panels of a comic.